Participants from Mexico, Chile, Guatemala, and the United States participate in a panel discussion on 'queerness' at Casa de las Américas' Casa Tomada. An amber grass covered the Parque José Martí Stadium as if, suddenly, a fall spell had enveloped Havana’s evergreen landscape. The infamous malecón, or seawall, where lovers, tourists, and alternative forms of nightlife usually congregate, was closed off to regular pedestrians and distracted passersby. Along that long stretch that connects Casa de las Américas and the Meliá Hotel, many of the privately owned restaurants had been reduced to debris. Irma, one of the most rampant hurricanes of 2017, had wreaked havoc in Cuba’s capital—not to mention the damage caused to other parts of the Caribbean island, such as Varadero. Despite the disaster that left Havana badly battered, a crowd of Latin American youth were determined to take Casa de las Américas hostage. And that is precisely what the name of the event seeks to evoke: Julio Cortázar’s short-story title “Casa Tomada,” or seized house. After responding to the call for interventions, I was invited to participate in this conference in my capacity as a public scholar from Latin America, presently based in the US, whose work engages with Latin American and Caribbean cultural studies. From September 19 to 22, over fifty participants from all regions of Latin America and the Caribbean, including artists, intellectuals, art collectives, and theater troupes, to name only a few, met daily over the course of four days that were intensely filled with discussion panels, workshops, public readings, street interventions, and forums. The purpose of this conference was to create a space for cultural interaction among the youngest of artistic creators and intellectuals from all over the region. Casa de las Américas is a historic place, where a negotiation between time, space, and cultural politics takes place as conference organizers and participants turn to the task of reinvigorating what it means to be a young producer of cultural capital in the Americas. The warm words of Arturo Arias, award-winning Guatemalan writer and UC Merced university professor who had himself attended this conference back in 1983, accompanied us during the inauguration ceremony. Arias insisted on the relevance of hosting a cultural encounter for young artists and intellectuals with the intent to engender “forms of seizing the future and inventing new ways of building sociality.” His introductory remarks set the tone for our own interactions and reflections that resulted in acts of personal bonding and in critical reflections on current sociopolitical issues, such as cultural sustainability in a neoliberal order, sociocultural inclusion, equality in cultural production, and emerging cultural movements of resistance across our region. Casa de las Américas is located in Havana’s urban neighborhood of El Vedado. Housed in a 1940s art nouveau building, this Cuban cultural institution represents one of the cultural jewels of the Cuban Revolution. It is a historic place, where a negotiation between time, space, and cultural politics took place as conference organizers and participants turned to the task of reinvigorating what it means to be a young producer of cultural capital in the Americas. Casa de las Américas also occupies a contested space in the cultural formations of Cuba and the Americas. Under Che Guevara’s overseeing gaze from a mural wall above the main stairwell, a wide array of cultural interventions, from theater performances to art exhibits and independent publishing houses, which infuse a personal politics into cultural production, defied that looming spirit of the past. Of relevance are the art exhibit Movimientos en intersección: Rastros de protesta en #BlackLivesMatter, #NoDAPL, y lxs DREAMers (Intersecting Movements: Traces of Protest in #BlackLivesMatter, #NoDAPL, and DREAMers); and the book exhibit Se miran y se toca. Panorama editorial joven latinoamericano y caribeño (They watch and they touch. The Latin American and Caribbean panorama of emerging publishing houses). Toques del Río and Hajnal Pivnick’s musical ensemble Tenth Intervention filled the building with funky and electronic musical iterations, while Mexican performance group SurOeste, Costa Rican theater troupe DelCarmen Teatro, Puerto Rico’s Las Nietas de Nonó, and Cuba’s dance project Proyecto de danza Fey, as well as Osvaldo Doimeadiós’ La cita, among many other interventions, provided an expansive space to exhibit a magnificent repertoire of contemporary dance, performance, and theater. Films by Tania Romero from Nicaragua, Camila Urrutia from Guatemala, Arturo Menéndez from El Salvador, Juan Rodríguez and Andrés Madrigal from Costa Rica, Sebastián Lingiardi from Argentina, and Carla Valdés León from Cuba presented some of the tendencies shaping an emerging cinematography. 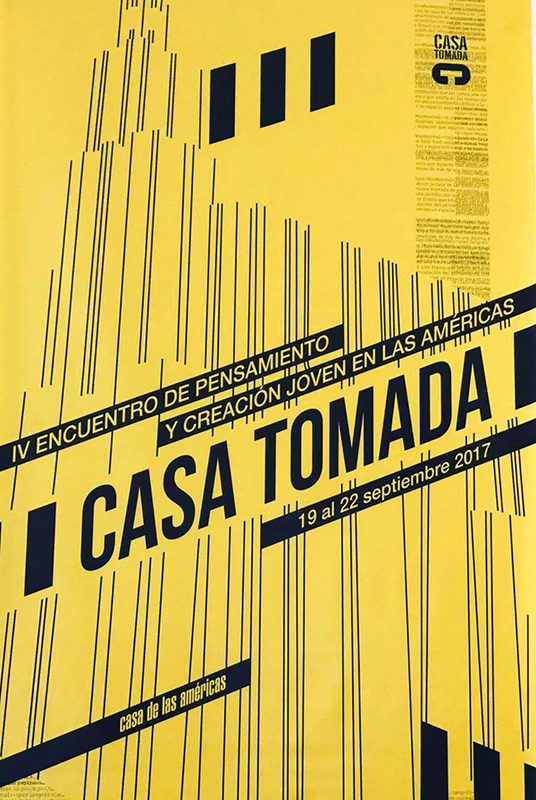 Also central to this 2017 edition of Casa Tomada was a deep reflection on alternative modes of cultural production amid an increasingly globalized neoliberal reality in the Americas. Cultural projects such as Nosotras Estamos en la Calle in Peru, the Cuban-Guatemalan project Muestra Itinerante de Cine Centroamericano Ícaro-Habana, Poesía y Trayecto in Mexico, Conjetura magazine in Costa Rica, Peabiru magazine in Brazil, BAFFU magazine in Belize, and CRIA in Argentina, and the publishing houses Cardumen in Colombia or Catafixia in Guatemala, constitute perfect instances through which young artists combat the force of cultural homogeneity and insist on context-specific initiatives that recognize cultural hybridity. As for my intervention, I had the opportunity to share a panel on El Debate Público de lo Queer (The public debate on queerness) with Guatemalan poet Manuel Tzoc, Chilean activist Javiera Massi, and Cuban American ethnomusicologist Matthew Leslie Santana. Perhaps this was the only panel, or even exhibit, that specifically dealt with the issue of sexuality and gender and its pivotal role in how intimate politics shape a cultural sphere among youth in the region. Without a doubt this was an intriguing panel. 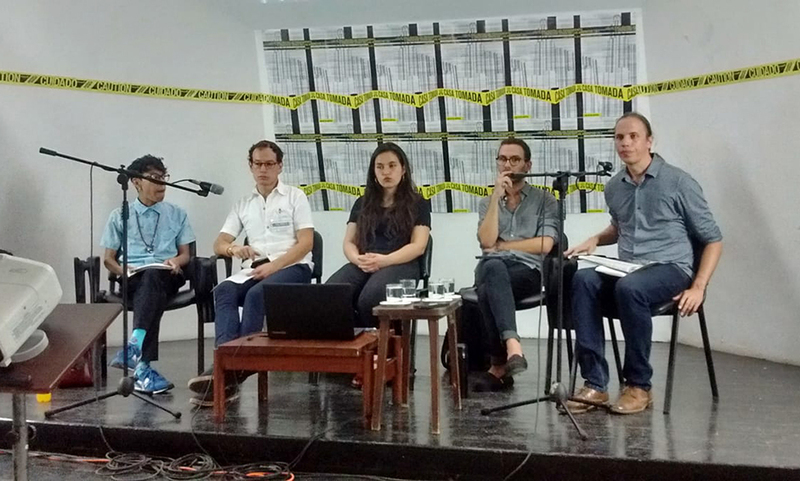 Not only was the conversation about sexual dissidence being discussed inside one of the most hegemonic Cuban cultural institutions, but the Pandora’s box of the queer debate in the Americas was also opened. Nonetheless, staging this panel meant precisely grappling with the eminent contradictions associated with a politics of sexual dissidence through cultural practices in the Americas. Our debate sought precisely to address those intimate acts of engaging a counterculture beyond patriarchal modes of world-making. Our debate sought precisely to address those intimate acts of engaging a counterculture beyond patriarchal modes of world-making. At the end of the day, I was particularly intrigued by one question that did not come from the discussion that followed our intervention per se but from a conference participant representing a Mexican NGO at a particular night outing. The French-Mexican activist, who also holds a doctoral degree from France, approached me to ask what all this queer stuff was about, and whether it would not be better to join forces with the labor movements in the Americas to vindicate sexual oppression. I responded that in the history of labor movements in Latin America and the Caribbean, at least in countries that have had them, sexual dissidence was not only excluded from labor activism but seen as a perversion of labor forces. As seen in Herbert Marcuse’s Eros and Civilization, labor and pleasure have been dissociated from understanding the complex balance between work and leisure, leading to an exploitation of workers in modern society and a distortion of their bonds to nature, desire, and freedom. The Front for Homosexual Liberation movements in Mexico and Argentina, with their own characteristics and contradictions, attest to a rupture between Marxist labor organizing and subversive modes of sociality. Labor is, and continues to be, a capital force for the patriarchal order, including neoliberalism, neoexpansionism, and neocolonialism. At the base of his question was not only a coy attempt to revive a genealogical strand of class-based Marxism in the Americas, despite its anachronism (i.e., neomarxism and postfeminism have already engendered the possibility of intersectionality), but also a conceited gesture, unconscious perhaps, to question the chronic relevance of sexual dissidence and leave unchallenged the interlocking structures of masculine power. His lack of knowledge about the queer affair in the Americas, one that has at least impacted in some way our adoptions of the term in the Spanish lexicon when referring to all things sexual, points to a symptom infecting our sexually dissident collectives: a deliberate form of cultural amnesia. This phenomenon was subsequently pointed out by Cuban intellectuals Norge Espinosa Mendoza and Roberto Zurbano, two figures who have shaped the cultural politics of sexual dissidence in Cuba today during our Q&A session. I refer to the cultural amnesia among sexually dissident collectives in the Americas as a notion to problematize the marginality and invisibility of these subcultural groups. Here I am not invoking a narrative of victimhood but rather a strategy for cultural resistance amid agendas that seek to silence the voices of difference: those that have fractured monolithic understandings of citizenship and belonging. It is also this cultural amnesia that plays a pivotal role in tracing the genealogies of our own cultural dissidence, or queerness if you may, and that produces difficulty in the public debates about sexual dissidence in Latin American and Caribbean cultural practices. More than translating queerness into this context, it is about tracing its manifold reiterations and significations from the iconoclasm of Reinaldo Arenas to the tacit erotics of Sor Juana Inés de la Cruz, passing through the diverse cosmologies of indigenous cultures across the Americas. It is about remembrance that debunks heroism in order to embody an intimate politics of affect that serves to dismantle vertical structures of sociality and cultural world-making. It is about enacting a tantalizing suggestion for hope. But beyond the reiterations of recovering a loss of hope and seizing the promise of what might come in the future, many of us also demanded new forms of language that could dislodge the left-infused notions of utopia, social transformation, and resistance. The general message to be taken from this conference also ignited a sense of hope, of an attainable utopia that echoed the 1959 Cuban Revolution’s own vision of emancipation. And the deployment of a utopian impulse even in the face of adversity, such as that recently produced by the passing of Hurricanes Irma and Maria, was precisely the type of ethos that this event attempted to instill in many of us. But beyond the reiterations of recovering a loss of hope and seizing the promise of what might come in the future, many of us also demanded new forms of language that could dislodge the left-infused notions of utopia, social transformation, and resistance. In other words, if Casa de las Américas, an extremely political and cultural avatar of the Cuban Revolution, had been opening its doors for youngsters to ponder new possibilities of imagining the world, what would it mean to then question the old ideals fervently embraced by previous generations while articulating a critique of the social forces that have shaped our biopolitical spheres in the here and now? With this inquiry also comes critical questioning of the political paradigms that have perpetuated a dysfunctional form of governance in the Americas, be it neoliberal, capitalist, socialist, Marxist, or even anarchist. David Tenorio is a PhD candidate in the Department of Spanish and Portuguese with designated emphases in feminist research and theory and critical theory at the University of California, Davis. He is an Andrew W. Mellon Foundation Public Scholar Fellow and also served as managing editor for Brújula: revista interdisciplinaria sobre estudios latinoamericanos. His research examines the representation of queer utopias in the contemporary cultural production of Cuba and Mexico.